JenniferIn some ways, the working conditions here are a little different than I'm used to. In Part I of this discussion, I'll cover Creature Comforts. First, the the coffee break, or fika. Every day, at roughly 10am and roughly 3pm, is fika. Fika may or may not involve snacks. The time of starting and ending is not exact; by some mysterious process, people suddenly emerge from their offices all at once and converge on a common room. This is a time for socializing, and although I have overheard some work-related topics discussed, most talk (at least in my presence) has so far involved odd Swedish customs and foods, the execrable accent of Danes, and the curiosities and absurdities of the US primary elections. By a process probably analogous to the start of fika, there comes a moment roughly half an hour later when everyone suddenly stands up and goes back to work. There are of course exceptions. Two weeks ago, when F. defended his thesis, he started at 10am (so no morning fika), and there was not so much an afternoon fika as a small post-defense party with champagne and chips. The Monday after that, a student celebrated the end of his master's degree by providing for a lavish fika for our sub-department with several cakes and sweet yeast breads. The day after that was Fat Tuesday, so we had a rather formal afternoon fika involving the whole department and semla. On such occasions, fikorna (I think that's the proper definite plural) tend to last more like an hour. Occasionally there will be a seminar or discussion group meeting at 3pm, in which case people bring their afternoon refreshments with them to the seminar room. Where do these fika take place? In my building are two common rooms, so let's tackle the large room on floor 1/2 used by the whole department first (yes, floor 1/2—more on floor numbering and department and sub-department structure later, it's a whole thing). 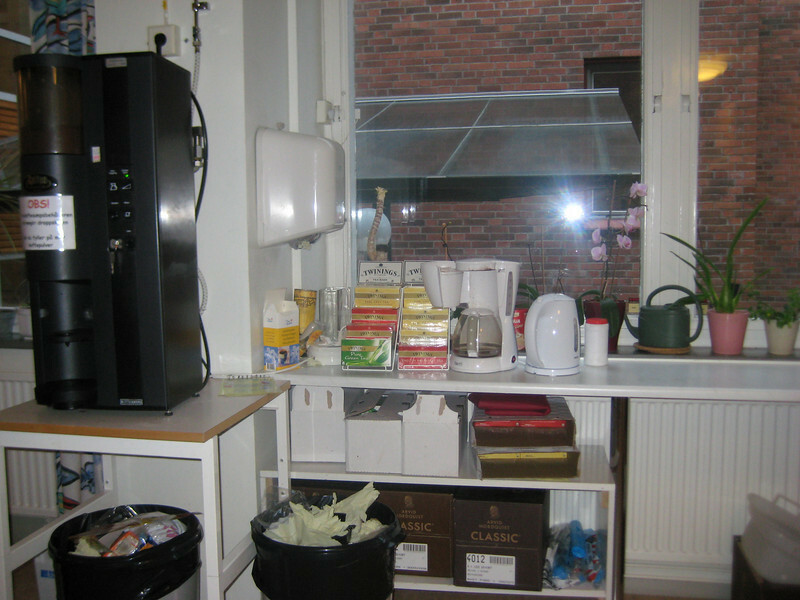 Morning fika tends to be in the 1/2 floor room, which has a large coffee machine, a couple of smaller, drip coffee machines, a electric kettle, an assortment of teas, the condiments you would expect, two refrigerators, two microwaves, two electric burners, two sinks, and a dishwasher, all provided for the use and comfort of students and employees, and all free of charge. There are candles on the tables, which are usually lit for morning fika, and orchids on the window sills. Everyone complains about the quality of the coffee, and yet, oddly, the coffee machine is rarely left alone for long. Floor 1/2 was the site of the department-wide Fat Tuesday celebration. The other common area is on floor 1, where my sub-department is headquartered. People in my sub-department tend to eat lunch there, and it is also used for sub-department "official" occasions (such as F. and the master's students' afternoon parties). 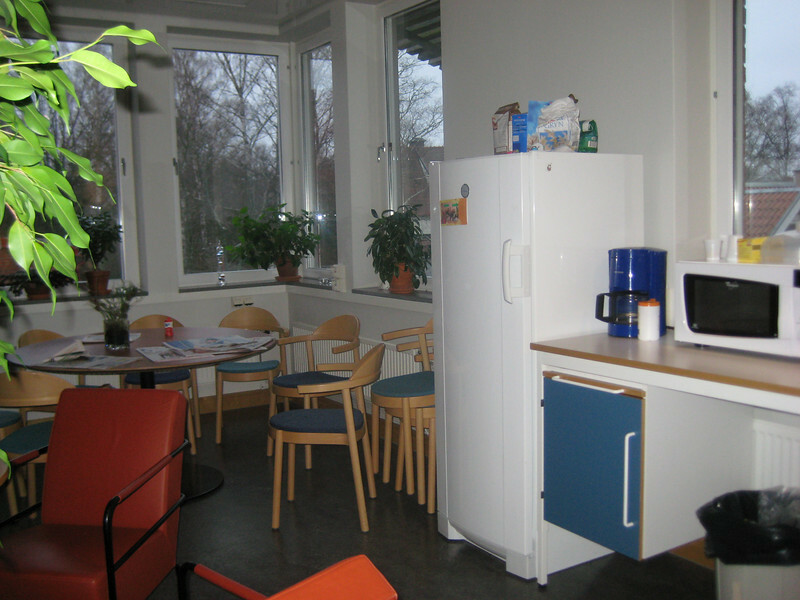 Here we manage to get by with merely a single refrigerator/freezer, a coffee maker, a microwave (made by Whirlpool! *), an electric water heater, and a sink for doing dishes. Candles are present but rarely lit in the afternoon. Being on floor 1 (that's the second floor to Americans), this room affords a great view of the fancy nearby houses, and lovely and soothing natural light, quite welcome after hours of staring at a computer screen. Rumor has it that there are recreation facilities in the basement, like a ping-pong table and a sauna ("But only the systematic botanists ever use the sauna," I was told). I have yet to see these things, but when I do, you'll hear about it. *An additional note for southwest Michigan denizens: Besides the Whirlpool microwaves, I have also run into some pressure gauges, the faces of which read "Gast: Benton Harbor, Mich." Small world!